MM Justus’ book “Sojourn” starts off with state trooper Daniel Reilly pursuing a truck across some pretty steep and hairy backroads in Washington State’s Okanogan County. It’s nighttime, of course, and his pursuit quickly goes off course and he finds himself skidding out of control into what is presumed to be a dangerous car wreck. He awakens to find himself being tended to by a group of kind, but somewhat mysterious people in a little “off the grid” town called Conconully. They kindly feed him and send their doctor, Amy, to tend to the injuries he acquired in the car crash. As he heals, Daniel discovers that the tiny town of Conconully is a bit of a mystery. Places and people seem to fade in and out of existence—the whole town can appear both vital and thriving and ghostly empty in the same night. The mysteries start to mount as Daniel recovers enough to begin exploring his surroundings. Things don’t add up, especially the nice townsfolk who refuse to answer a single question while at the same time wanting him to take on more responsibilities as he recovers. He quickly makes friends with Dr. Amy, who seems to hold the key to explaining the town’s odd dislocation from modern life, but who also seems to be unable or unwilling to give him the details. Some of the other residents of Conconully, including the town’s plaster pig (see image below) may be hiding an unearthly secret. As he starts to puzzle through the mystery, the town of Conconully steadily grows more ‘real’ to Daniel while his desire to return to his life in the “outside” world dims. Will he have the chance to make that decision on his own, or are the people of Conconully purposely misleading him for their own ends while hiding the truth long enough to keep him trapped in their little ghost town forever? 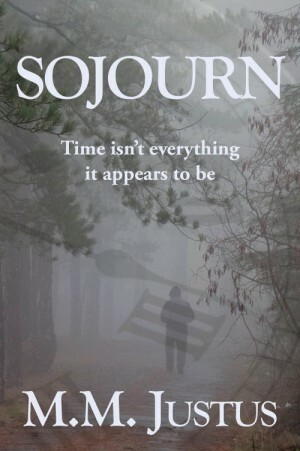 I had a quick conversation with “Sojourn” author MM Justus the other day, where I complimented her on her wonderful “novella”. She kindly corrected me that –at 226 pages—it’s not a novella, but a full length novel. The truth is—this story reads so perfectly smooth from start to finish that I had no idea the amount of pages flying beneath my fingers. It has everything I look for in a first person POV story, namely, an intriguing and engaging protagonist, a mysterious setting and a ton of riveting questions that are handled adeptly by the author. The story pulls the reader in almost immediately and I found myself caring very much for Daniel’s well-being, both physical and emotional. The surrounding setting shows depth and research with more than a little historical fact thrown in. Even though every other character in her story is a secondary character, MM Justus makes each of the Conconully townsfolk shine with individuality. You get the feeling that they have lived lives (long lived lives, that is) that take place before the story and will continue on after the story is finished. The mysteries of the strange ghost town are allowed to build and multiply, creating a tight tense narrative that delivers on all of its promises. A resounding story from an accomplished storyteller and a clinic for first person POV that all new writers would benefit from reading. Alternate History Paranormal Novel Perfectly Written. Highly Recommended! Give a brief description of your first written story, whether it was published or not. I will not bore you with the teenage fanfic (back before I knew what the term fanfic meant) I wrote, but my first real story was about a haunted lighthouse. I still plan to go back and do something with that plot one of these days. Who is your favorite author and how did s/he influence this novel? I have two favorite authors, actually. One is Lois McMaster Bujold, and the other is Elizabeth Peters/Barbara Michaels (two pen names for the same author). Bujold didn’t really influence this novel, but I was deeply influenced from early on by Barbara Michaels’s stories about normal people dealing with the supernatural, which is one of my favorite things to write about. What is the most unusual inspiration (place, book, person, etc.) that you can credit for your novel? I can’t help laughing. Would you believe a plaster pig? In a small half ghost town in central Washington, so close to the Canadian border you could throw a baseball over it from there, there’s an old building with two bay windows. Inside one of those windows sits a plaster pig, who wound up as a major character in my book. His name’s Harry, by the way.